supreme comfort starting at $898! Axel Bloom specializes in the most advanced German Adjustable Bed Technology and Luxurious European Mattresses. Our showroom in Los Angeles exhibits bed systems from Germany and Austria including adjustable beds that have sophisticated, patented suspensions for the most superior support and comfort. Our adjustable beds have unique suspensions that flex like a car suspension and designed for personal settings. Our European mattresses are engineered for sublime sweet dreams. Unlike regular adjustable beds that only use flat boards to raise and lower the back and foot sections, our adjustable surfaces have additional suspensions consisting of multiple slats and individual pods of different firmness. Similar to car suspensions, this hybrid mesh serves to smooth out the pressure points of the body and align the spinal cord. place flat on platform bed! ideal for RVs, trailers and Motor homes. custom, us and European sizes! On top of these suspensions, our Luxurious European mattress, with complex air hole structures, serves to further align the spinal cord, provide custom back support to alleviate pain and enhance cool sleep with NATURAL TENCEL® covers for the ultimate luxurious sleep experience. In addition to European mattresses, suspensions and bed frames for the home, we make Adjustable beds for RVs, Motorhomes and Trailers of all sizes. We also make custom wood and fabric bed frames and sofas. In our Los Angeles, California showroom, we offer US, European and RV sizes for our adjustable beds and mattresses. Come visit us in Los Angeles, take your time to research our beds, frames, and sofas online or call us: 866-696-8387. Willkommen! What is Special about Axelbloom beds and Mattresses? Our adjustable bed systems can be installed in a standalone configuration or into an existing bed frame. We have unique adjustable beds that are ONLY 5 Inches Thick which can be placed on platform beds because the motors are integrated into the frame. Our flat adjustable beds are uniquely suitable for RVs since they are ONLY 5 Inches Thick and can be placed on top of a platform bed. We offer custom RV sizes. As the photos below show, the two halves of the RV adjustable bed sections are simple to install side by side. The storage area under the bed can continue to be accessed by lifting the platform. Typical adjustable beds for RVs are shorter than standard queen or king sizes. Typical RV mattress sizes: Short Cal King 72 X 75 inches, short Queen 60 in x 75 in or a short Eastern King size can be 76 x 75 in. We can provide them as one adjustable size or as two half systems which move independently. We also offer custom sizes for adjustable beds and RV mattresses. Axel Bloom European mattress cores consist of different layers of breathable "Kaltschaum"- Cold Foam. The core is covered with a TENCEL®, natural cellulose weave which is comfy and wicks away perspiration. The mattress cover can be unzipped, machine-washed and dried for hygienic sleep. 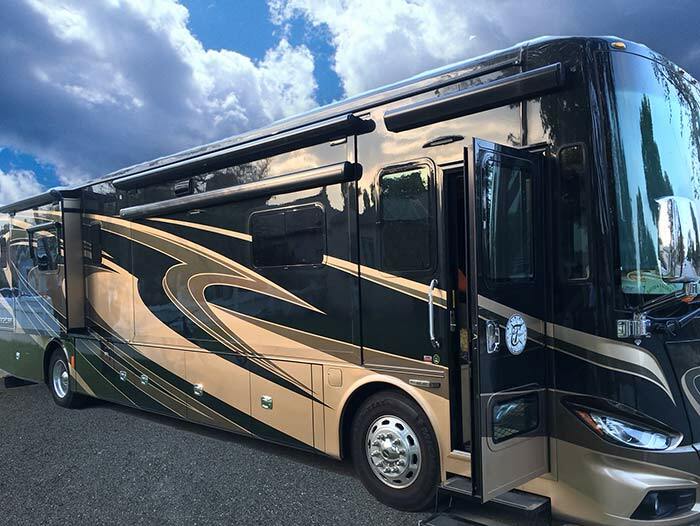 We offer US, European and custom RV sizes. Our mattress core has a 10-year warranty. The high-quality foam is made in a process that is similar to making soufflé. it requires well-filtered, purified ingredients, manufacturing techniques that allow the foam core to expand uniformly and materials that minimize outgassing. The proper manufacture and combination of foam structures results in a mattress that provides consistent support for years. Axel Bloom's showroom is in Los Angeles, California. Many customers purchase by phone and we ship to US and international customers in Canada, Hong Kong, Singapore, Switzerland, Mexico, Colombia, Macau and the Bahamas. 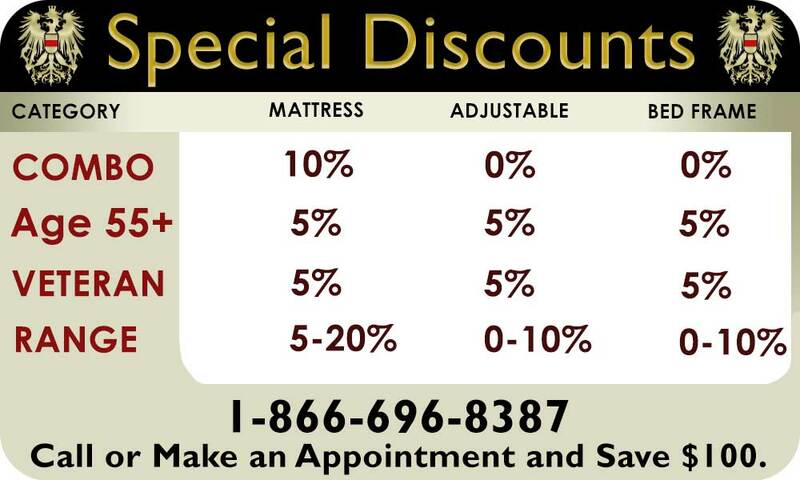 Combo Discount - 10% off for mattress when purchased with adjustable bed. Senior Discount - 5% off for ages 55+ on adjustable bed/mattress & bed frame. Veteran Discount - 5% off on mattress and adjustable bed and bed frame. Please let us know of any questions you might have.